Today we have been married for 4 years. We were married at a Family Lodge on the Per Marquette River. It was a small wedding consisting of close friends and family, it was just perfect. For our first three anniversaries we went to La Bistecca in Plymouth. La Bistecca is romantic and the food is always wonderful but I wanted to try something new and, well I will admit it, I wanted to try escargots. After hours of searching the Internet and browsing every local online menu I could find I chose Weber's in Ann Arbor to celebrate 4 years of marriage. I experience was mixed. When we arrived they sat us at the worst table in the entire place; however, after complaining we were moved to a more acceptable table. We had a good waiter and the food was good, not "the bomb" but good. I had the roast duck and it was a little tough and DH got the prime rib combo with sward fish. This was DH first time trying sward fish and they did a very nice job preparing it and we both thought it was excellent. 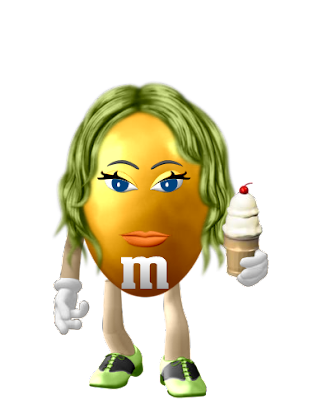 I lost my pictures so I have nothing for this post. Mackanac Island, the sweet smell of sugar and horse crap. I love this Island! There are no cars on the island; therefore, everything and everyone are transported by horse or bike. Fudge everywhere, there has to be 20 fudge shops on the 5 mile Island and almost all of them give free samples. Mary's Bistro The Best Turkey Burger ever not to mention the other food is great too. this is my must have when ever I go to Mackanac Island. We are heading home today and we are going the long way from St. Paul, through the upper peninsula of Michigan. The Plan was to get as far as Escanaba, MI and stay the night; however, after asking a few question we found out it was only 3 hours to "the Bridge" and that being our planed destination for the next day we kept going after dinner. Dinner was at Hereford & Hops Restaurant and Brewpub. This was an interesting restaurant because they had a large grill area where you choose and grill your own stakes it look great however, after 6 hours of traveling I did not have the energy to cook my steak nor did I want to eat a heavy steak. I was in the mood for a drink and they had just the thing, a nice DARK beer. It was the Black Springs Double Stout and it was very good. The Description describe this beer with hints of dark chocolate and liquorish, two of my favorite candies and this beer lived up to its description. I got Brochette which was very good and clam chowder (my DD eat all my chowder) . Hubby got all you can eat peel and eat shrimp (reporting that is was good) and the kids got cheese, crackers and fruit plate that they listed on the kid many however it did not come with crackers and a lot of melon (my kids eat a lot melon not being one of the things they eat). My son had some shrimp. Now off to drive the last 3 hours until we get to stop for the night. While in Milwaukee we went to the Zoo and after that we headed to Marquette University for Lunch. We found a little place on the corner of Wisconsin Ave and 17th called Ziggies. We walked in and the man behind the couner greeted us with a big smile, ton of charm and a greek accent. I knew this was the right place! He was so sweet with my 3 year old daughter (taking her over for a very big ice cream sample) talked with the kids with such enthusiasem and the smarkle in his eye when he talked about his food. He was a food lover and proud of it. Hubby got the Gyro which looked wonderful (he never offered a bite) this came with homemade Jaijki sauce that was out of this world. 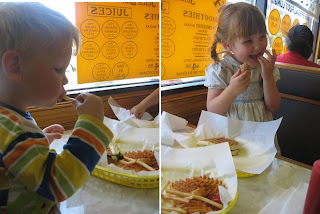 the kids got cheese paninis with waffel fries. When on the road with a 2 year old and a 3 year old all plans are out the window and so was eating in china town Chicago. we had to stop just on the west side of Michigan City for lunch and Schoops Hamburgers was the place. It is a little chain with a Mom and Pops feel serving burgers, fries and milkshakes ext. Hubby got a burger, of course, and it was huge. He said he had never had a burger quite like this one because the meat was thin and slightly crisp. He did report that he liked it. I got the chicken cordon blue that was also huge and very tasty; however, the onion rings that I ordered left something to be desired. At this point Hubby and I decided that it would be good idea to start splitting meals. The kids got their first corndog with fries. DS did not eat his but DD loved hers. For Dinner I was hoping for something new and I sure found the right place for that. The Bavarian Inn is very unique in decor and menu. However, it was us and the old farts, retired people always know the best little places. Hubby and I split an order of Roast pork, garlic mashed potatoes and sauerkraut. this worked out nice for me because I love sauerkraut and Hubby does not. The food was very good, I would say it was like homemade, you can't get much better then that. I also had the lentil soup. It was good soup but I did not like the caraway seeds in it. This is not a place I would recommend taking young kids to. They do have the standard kids menu items; however, the clientele can easily get irritated if your children are not as quiet as a mouse. My two were well-behaved for children that had been cooped up in a car for 6 or more hours (only getting louder than the other tables 3 times) but I could tell a few people were slightly irritated. I am leaving Thursday to Minnesota for a week and will not be posting while I am gone. I look forward to seeing what everyone posts on their blogs while I am gone. the other day I made a fig tart that was very very rich, it was so rich that you could not eat it or it would make your head hurt. I happened to have some pears that were getting over ripe so I took the filling of that fig tart chopped it up and added a 1/2 t anise, pinch smoked chipoltly powder, ground clove, salt, and nutmeg. Cut the pears in half and scooped out the core with a melon baller. in the hole in each pear I stuffed in a tablespoon or so if the tart filling and then baked in a preheated 375 oven for 20 minutes. right after I graduated from High School I got a job at a local grocery store (D&W) and I worked there until a few days before I turned 21. One of my fondest memories of working at the store was the turkey salad on a pita I used to get for lunch. This turkey salad was special because it had grapes in it that just went so well with a whole wheat pita. Often I have dreamt of that sandwich and a few weeks ago I decided to try to make it and it is better than I remember. Drain water off of Turkey and place turkey in a medium bowl add in all the chopped vegetables and grapes. Mix the mustard, mayo, yogurt, salt and pepper in a small bowl and then add to the turkey mixture. Stir all the ingredients together and serve on crackers, on lettuce leaves or (my fav) Milton's wheat Bread. I had some leftovers piling up in my refrigerator. A little left over ratatouille, tomato sauce and some mozzarella fortunately I also had some mushroom tortellini in the pantry and so came tonight's dinner. I heated up the tomato sauce with the ratatouille while I cooked the tortellini in salted boiling water. once the pasta was done I mixed it with the ratatouille marinara and covered with the mozzarella and placed all of it under the broiler until it was all melty and a little browned. yummy, yummy it was good served with a little garlic bread. Mix nuts into cold caramel. 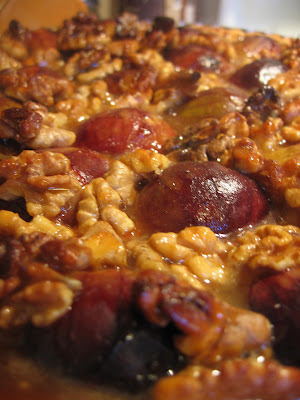 arrange figs in a circular pattern around crust filled tart pan (see below) spread (pour) caramel nut mixture over figs. Measure flour sugar and salt into a bowl. Cut in butter thoroughly with a pastry blender or two knives until mixture resembles coarse crumbs. In a small bowl, stir egg yolk and water together. Pour this mixture into the flour/butter mixture and mix until a ball of dough forms. Shape the dough into a disc and refrigerate at least an hour. Roll out dough and form into a 10 inch tart pan. Prick dough with fork and pre bake crust for 10 minutes. remove from oven. and fill. I had this for the first time last fall, a friend made it and it was ok. I had never had it and did not know what to expect or what to think, now that I look back I am sure it was a good recipe. A few weeks ago I saw Nigella Lawson making this on her TV show and all of a sudden it sounded so yummy so I had to make it. This is the first time that I have ever tried to make matar paneer so I read through Mahanandi and Nigella Lawson's and came up with my own combo and I think it turned out very nice for my first try, maybe add a little more spice next time and some liquid. Heat the oil a large skillet and add the paneer cubes, in 2 batches, and fry until they are golden. Remove the golden cubes to a paper towel to soak up any oil. Pour all but about 2 tablespoons of the oil out of the pan. Add the onion and cook until they are translucent. Add the garlic, ginger, and spices. Stir to combine and cook for one minute, add the tomatoes and cook them down. stir in the peas and water let the peas defrost a little then add the paneer. stir to combine, cover and simmer for about 5 minutes. I served this with rice and enjoyed every bit. 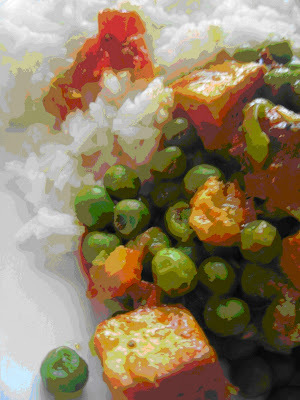 I also got the kids to eat all the paneer and rice and each had at least one pea. My Mother and I took the kids to see Ratatouille last weekend and it did get me wanted to make the dish just as it made every other food lover and blogger out there want to. I have made the traditional Ratatouille before and I did like it. My Daughter (31/2), as always, helped me make this Ratatouille. first we did my dish and she handed me each item as needed; however, when we were done there was a lot left over so I let her make her own. She layered the zucchini, yellow zucchini, eggplant, mushrooms and peppers and when she done layering I let her chose what herbs to put on it she chose the thyme and lavender that I used and then she went through my array of dried herbs and pulled out tarragon, it was not bad in the end. To tell the truth both were wonderful, better then the last time I made it. saute the onions in 2 T olive oil until translucent and add minced garlic and cook for a minute. add in paste and cook until it fragrant and then pour in tomato sauce and bring to boil. add in, the soup seasoning half of the thyme, half of the lavender and the rosemary. Remove from heat. pour a drizzle of olive oil over the layers of vegetables and sprinkle with remaining thyme and lavender and season with salt and pepper. cover with parchment cut to size and bake for about 50 minutes. I served the Ratatouille with french baguette and some plain low-fat yogurt for a light and refreshing dinner. I did not have any parchment so I cut a paper bag to size and it work well. Thank you Smitten Kitchen for some direction. The kids picking ripe blackberries at Grandma and Grandpa's house.